Annual. 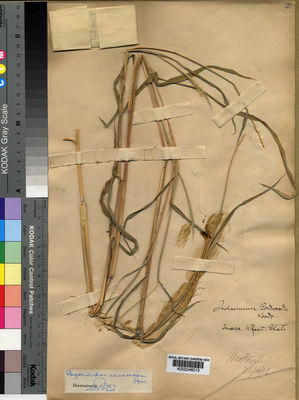 Culms 60-100 cm long; rooting from lower nodes. Ligule an eciliate membrane. Synflorescence compound; scanty. Inflorescence composed of racemes; terminal and axillary; subtended by a spatheole. Spatheole linear; herbaceous. Racemes single. Rhachis fragile at the nodes; flattened. Rhachis internodes linear. Spikelets solitary, or in pairs. Fertile spikelets pedicelled; 1 in the cluster. Companion sterile spikelets sessile; 0-1 in the cluster. Pedicels cuneate; tip cupuliform. Companion sterile spikelets absent, or represented by single glumes; persistent. Spikelets comprising 1 basal sterile florets; 1 fertile florets; without rhachilla extension. Spikelets lanceolate; laterally compressed; gibbous; 8.3-12 mm long; falling entire. Spikelet callus cuneate; bearded; base truncate. Companion sterile spikelets absent, or represented by single glumes; persistent. Spikelets comprising 1 basal sterile florets; 1 fertile florets; without rhachilla extension. Spikelets lanceolate; laterally compressed; gibbous; 8.3-12 mm long; falling entire. Spikelet callus cuneate; bearded; base truncate. Glumes exceeding apex of florets; firmer than fertile lemma. Lower glume ovate; coriaceous; without keels; 7 -veined. Lower glume surface pilose. Lower glume apex acute. Upper glume ovate; gibbous; coriaceous; with membranous margins; without keels; 5 -veined. Upper glume surface pilose; with a dorsal tuft of hair. Upper glume apex acute. Basal sterile florets barren; with palea. Lemma of lower sterile floret lanceolate; hyaline; 3 -veined. Fertile lemma oblong; hyaline; without keel; 3 -veined. Lemma apex dentate; 2 -fid; obtuse; awned; 1 -awned. Principal lemma awn from a sinus; geniculate. Palea 0.8 length of lemma; 2 -veined; without keels.